Since the PS3 doesn’t have any good RPGs or strategy games of its own yet, I would like to take this opportunity to recommend a few rare games that may actually be compatible with the PS3 by now. I won’t lie; some of these games are inordinately expensive by used-game standards. But even the most expensive doesn’t cost twice as much as a new PS3 game. 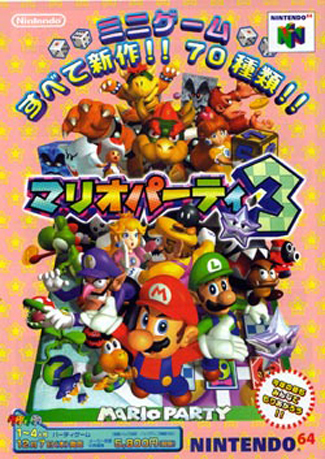 My intent with this is to show you all that the PSX was, in some ways, an incredible system; it may not have had the sturdy character of the N64, but even though I am fascinated with obscurity, I hadn’t heard of several of these games a few years ago – well after the PS2 had taken over. Since Persona 3 came out (I have been playing it much of the last month), it seems appropriate that the two predecessors that made it to North America be on this list. Persona 1 flew under the radar, as it was our first encounter with the Shin Megami Tensei series, and it came out in a time when Square ruled the Earth. 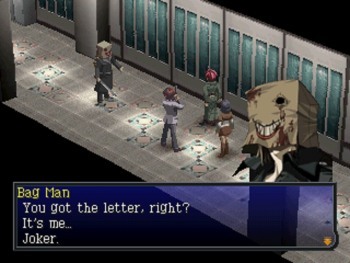 Persona 1 brought an entirely new perspective to RPGs; not only could they be modern, they could be vaguely creepy, poorly translated, and pose philosophical questions without offering answers. Unfair as that last bit was to my teenage self, I loved the game. When you can use a submachine gun one round and then stab the enemy with a katana the next, what’s not to love? P1 is difficult and complex, but it is definitely beatable – and the characters and setting are well worth the effort. Seeing the reaction of an entire modern-day town to a demonic invasion is still quite enjoyable to me. Unfortunately, Persona is one of the most expensive games on this list. Its sequel (which is actually the 2nd half of its sequel, funny story) was mercifully reprinted by SMT-loving ninjas Game Quest near the end of the PSX’s life, and is not nearly as expensive. Unfortunately, it is much more difficult and has fewer swords (unforgivable!) than its predecessor. In what was no doubt an apology for making Persona 1 too easy (it wasn’t), Atlus crafted the aptly-named Eternal Punishment; a monster of a game more than twice as long as the first. Few gamers have dared to tackle its perilous ways, and fewer still have conquered them; I must confess I did not last long against its cruel might. That’s not to say it’s a bad game, though – if you like hard RPGs, it’s worth a shot. Just be prepared – I never beat a boss battle on the first try. The best original non-action game Koei has released in the past decade (has it been that long already? ), Saiyuki: The Journey West is based on a classic Chinese novel. For once, I don’t recommend reading it – the original novel is bland and repetitive. This game is, by comparison, much more entertaining. Though the story still follows the travels of a Chinese Buddhist monk to India, there is a distinct fantasy feel to the game – as magic and entirely new characters are added. Where did this Chinese Buddhist monk get that sombrero? Where Saiyuki really shines is in the “feel” of the game – the art and music style combine to make a game that is incredibly relaxing – even when your giant were-ape is madly crushing club-wielding kobold-things. Large portraits in a light anime style and beautiful magic effects finish off the game. 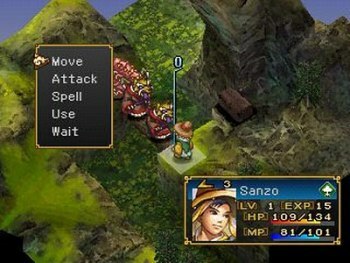 Saiyuki is sometimes called a poor man’s “Final Fantasy Tactics” – and it’s true, it is the lesser game engine-wise, being only marginally more complex than Shining Force. I may prefer FFT, but I don’t think that diminishes the fact that Saiyuki has shown me a game can be both soothing and difficult at the same time. Let me start this one off by saying: I don’t really like this game. I can appreciate its engine, but I can also see it really isn’t my thing. It could, however, be yours. VH2 is somewhat similar to the first entry – the art style of characters’ bodies is similar, both have intrigue-filled plots, and both are tactical RPGs played on a grid. One of the most bizarre things about the graphics, and the only major artwork departure, is the portraits. They are stylized like photographs, while the character’s body is an anime-ish sprite. It doesn’t fit at all. But on to the meat of the game! Skills are unlocked via weapons and armor, and there are no “classes”. So, you could have a thief with flying armor (though he’d be weak) or a fighter with magic robes (he’d probably be weak too). Skills can be transferred from weapon to weapon once mastered, so you can “build” a character – but I found my characters often in a state of flux, equipment-wise, which didn’t sit well with me. The Allied forces actually defeated Hitler largely because of motivational music. The turn structure is worth noting too – it is similar to some board games. At the beginning of a turn, you move one of your characters. Simultaneously, the enemy moves one of its characters. They resolve at the same time. You can fake the AI – if you know a character is about to be attacked, move him away. Better yet, move him next to where you think his attacker will go – and attack there. It’s a neat idea, but the AI seems to oscillate between evilly cunning and incredibly stupid. VH2 gradually becomes a game of guessing where your opponent is going next, and when the AI can be so unpredictable, it gets to be tedious. persona is expensive?! and the conservative video-game-heavy portfolio pays off for the hungry investor! I’ve never heard of Saiyuki before, thanks for the recommendation. So many weird little games were released for PS1 and I was such an impoverished high school student through much of it’s lifespan that I’ve ended up missing a lot of potentially great games on the system despite my fanatical devotion to it back in the day. It’s funny to see how little tactics style games have matured graphically in all this time. 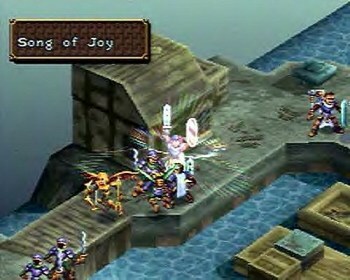 That screenshot could be from Disgaea 2 and I wouldn’t know the difference, except for the art style. How are you like Persona 3 so far? Are the monsters and characters less interesting now that a different lead artist (the Stella Deus guy) is on the team? I’ve been eyeing the game, but not having the Kazuma Kaneko’s art in there has been surprisingly demotivating. I am actually really liking P3 in some ways, but I’m disliking it in some others. I’m going to beat it this weekend, unless something goes horribly wrong, so I’ll have a review up soon. As far as art goes… I really like the characters, but the monsters are quite bland.